When you consider your dog part of the family, you want to do everything you can to keep him healthy and disease free. Fleas and ticks aren’t just annoying, they can spread disease to your pup. Ticks spread Lyme disease. Do you know what Lyme disease is? The signs and symptoms? How dangerous it is? I will admit that before researching this post, I didn’t really know what it was. A recent Angus Reid survey of 1,011 Canadian dog owners revealed that 34% don’t consider Lyme disease a serious threat, only 6% of dog owners recognize the symptoms of the disease and 64% would buy a monthly topical treatment to protect their pet from tick bits if the vet recommended it, but 56% say the vet has never talked to them about the danger of tick bites. 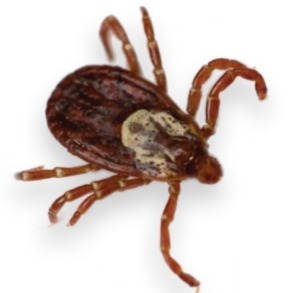 Ticks are tiny bugs that feed on blood but unlike mosquitoes that drink a little and leave, ticks attach by burrowing their mouth into the skin, where they feed for hours or even DAYS before falling off completely full. Ticks move slowly and cannot fly. They usually come into contact with people and animals in tall grass or wood areas. Bites are generally painless and symptom-free and they often go undetected because they are so tiny. It’s a bacterial infection that is transmitted to dogs and humans by ticks. 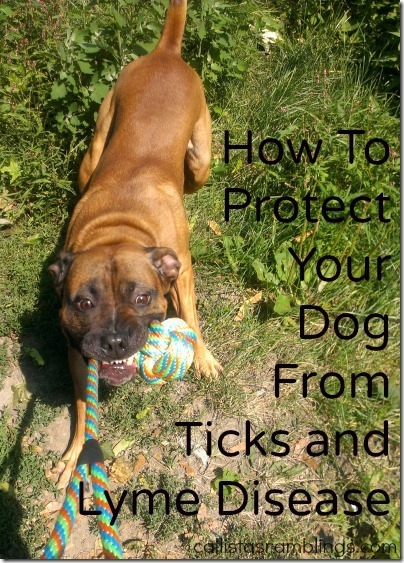 Ticks become infected when they feed on smaller animals like rodents that carry the bacteria. 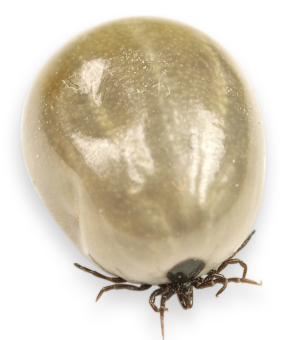 It usually takes about 24 hours of feeding to transmit infection so finding and removing ticks promptly is important. The disease cannot be spread between humans or from dogs to humans. Symptoms in both dogs and humans include: fever, fatigue/lethargy and swollen lymph nodes. Dogs may also have loss of appetite, lameness and skin signs while humans may also have a bulls-eye rash, chills and muscle and joint pain. Untreated Lyme disease can progress to severe arthritis, heart irregularities and nervous system disorders in humans and heart disease, kidney problems and neurological signs in dogs. If you go to wooded areas or areas with long grass, check your dog (and yourself) over afterwards carefully for ticks. Remove ticks with tweezers by grabbing them near their mouth, as close to the skin as possible and pulling straight out (not twisting.) Do not grab it’s swollen bely as you could push infected fluid into your body. If parts of the ticks body are left attached to you, remove them with the tweezers too. Give your dog K-9 Advantix II, a once a month topical solution that kills fleas and ticks (4 different kinds that carry other diseases in addition to Lyme disease) from Bayer Animal Health. K-9 Advantix II protects against ticks and fleas with three active ingredients: imidacloprid, pyriproxyfen and permethrin. It attacks parasites’ nerve cells, paralyzing and killing them on contact. I had a Dog Days of Summer Giveaway valued at $100 for one lucky Canadian pooch courtesy of Bayer Animal Health. This post brought to you by Bayer Animal Health.